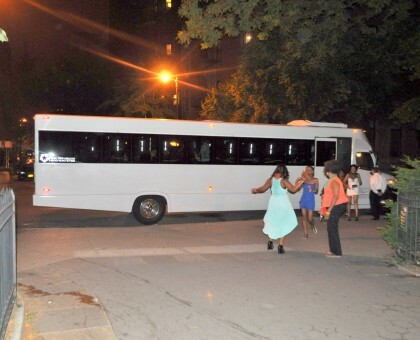 Forget Kustard King & Fresh Direct: How About A Raucous, Rumbling Stretch-Limo Bus? Any Brooklyn Heights residents miffed by the buzzzz of the Kustard King ice cream truck parked along Pierrepont Street or the persistent rumbling of Fresh Direct freezer trucks at all hours might be interested to hear about the limousine-like bus parked along the entire Montague Street entrance to the Promenade Friday night. The vehicle’s AC system was louder than a helicopter, while its posse of tourists found it apropos to treat their visit to the Heights like a Justin Bieber concert—whooping, hollering & laughing like hyenas into the night. I tend to be a come-what-may New Yorker, and typically take pride in the fact that our nabe is a tourist magnet. But even I have limits. This bombastic lack of respect rattled me to the point of… daring to have an opinion on the Brooklyn Heights Blog. Mind you, I’ve learned that sharing such here is seldom prudent, given the response of knee-jerk anonymous posters. But this time, I’m willing to risk it. Mind you, I’m anticipating that some dimwit will bring attention to the fact that this might have anything to do with the fact that the folks pictured are Black. I said noise… not race. Karl and the Nets: Perfect Together?